On February 3, 2004, a large dust storm swept westward off the coast of northwest Africa and, for the next two days, fanned out to the north and west over a large portion of the eastern Atlantic Ocean. This true-color image was acquired on February 6 by the Moderate Resolution Imaging Spectroradiometer (MODIS) aboard NASA’s Terra satellite. The scene shows the West African coastline from Morocco (upper right) to Guinea Bissau (lower right). 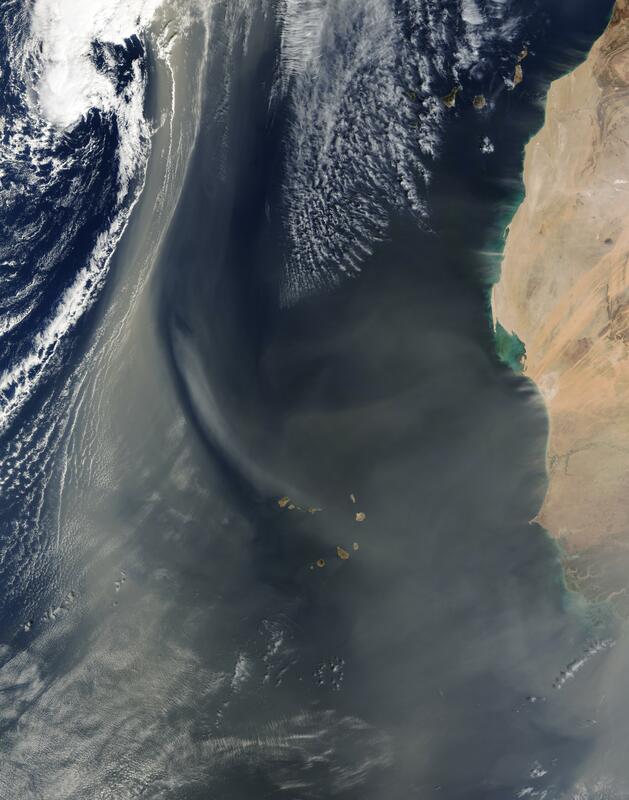 Streamers of Saharan Desert dust (tan pixels) continue to blow out from Morocco toward the Canary Islands, while the Cape Verde Islands to the south (bottom center) appear to have taken the full brunt of the dust storm. As it moved westward, the dust appears to have become entrained into a strong southerly air current, creating a vast arc of dust stretching more than 2,000 km. Notice the “wind shadow” extending northwestward from the Cape Verde Islands. The islands formed a break against the wind, creating a clear pocket of air behind them that is itself being pulled and carried northward with the strong southerly wind.